Once in a while we get unpleasant situations, dilemmas or crisis that surprised us at the work place and we enter an unstoppable panic zone. We stress, over think and finally we meltdown And that reaction can result in a long-term damage which can affect you work ethics. Many of the world’s greatest achievers, including entrepreneurs, athletes and artists, could not have reached their level of success without learning how to stay extremely calm under pressure. As the step is tittle, slow down remain calm and don’t take any action on the spot. Try to fully understand the situation, you might also want to collect as much information as possible because it will help. Usually when we get in a stressful situation, our mind flies to the negative side. Instead, let go of negative thoughts and refocus your mind on something positive, no matter how small. Once our minds start wondering off, we start asking ourselves and people around us “what if?” This question often suggests the worst case scenario and that pushes us into more panic. Controlling your body will leads to self-control. Exercise lowers the level of stress hormones and helps the body function at its highest level. The healthier your body is, the more accurate your memory and emotional intelligence will be. Once the crisis hits us, our reflex is to get some energy because we think it’s the only way to handle the situation, only for us to get hit by a storm of fatigue later on in the day. Dehydrating ourselves with water is the best way to stay on top. 6. Call a trusted friend or mentor. Confide in a trusted friend or someone you look up to, who is not attached in any way with the situation. Talking to a friend or a mentor will help you hear a get a better understanding of the dilemma and it will help you get new ideas to solve the problem. Get away from the situation for a moment even if it’s for a small period of time and reprocess the situation. This will help you come up with new solutions and new ideas. A crisis may require you to invest more of you personal time in your work, like working late at the office or working home on weekends. That requirement will increase your level of stress and fatigue which can affect your health and undermine your ability to make rational, informed decisions. To be able the manage everything, find a hobbits that makes you feel at peace. For examples, meditating, doing yoga or even taking a walk. These techniques can help you feel more empowered to handle many situations. If you run your own business, the chances of you being busy are quite high. With all the different tasks you have to perform during the day and all the inbound and outbound calls being made, chances are you have little to no time for those social media promotions. Let’s face it, social media isn’t something to be ignored. It is an essential part of marketing in reaching your customers, gaining new clients and generating business for yourself. If you aren’t finding enough time in the day to devote the time you need in social media each day, scheduling your posts ahead of time is what many have turned too. With programs such as Hootsuite, Uberflip and Sprout Social, they have made it easier for you to do the promoting through social media. But with every pro, comes a con. 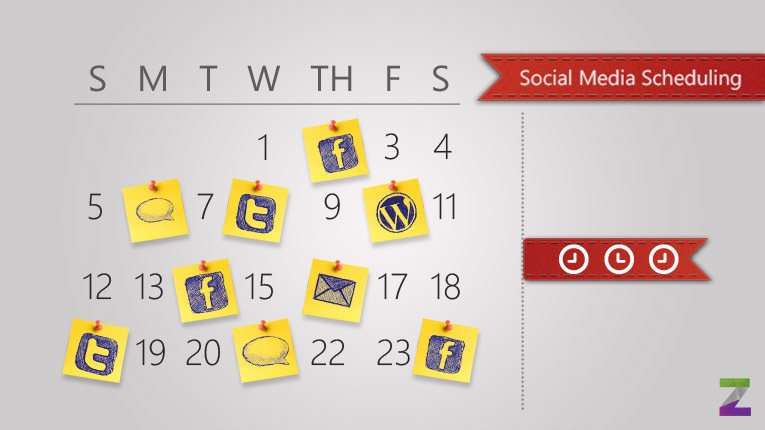 Here are some pros and con of scheduling your social media posts ahead of time. Flexibility. If your work day is very hectic and you aren’t sure you will be able to update your social media accounts regularly every day, let a pre-scheduler program handle that for you. By scheduling your posts ahead of time, your posts will go live at the time and days you need them to do. Rather than worrying about finding that time to schedule your needed post when it needs to be live, you can worry stress free by planning ahead. You don’t have to to physically be at the computer to do it. Reach your audience better. By scheduling your posts ahead of time, you know your audience will be tuned in making your post more effective. Without scheduling, there may be some days where you aren’t able to post when your audience is checking their social media. Scheduling will always help you stay in tune with your audience, even on those super hectic days. Save you time. Being able to set aside some time in your week, to simply schedule and lay out your social media posts for the week can save you lots of coveted time. It will open up the rest of your week to be worry free about making sure you have posts going out when needed be. Mistakes can happen. Sometimes when you schedule post and tweets several days ahead of time at once, things get mixed up. You may end up posting the wrong link with the wrong tweet, or misspelling words in your post and you won’t realize them until it actually goes live. This can potentially cost some of your audience members to unsubscribe if they find your social media pages to me poorly-run or confusing. You may not be able to respond in live time. If you schedule your posts to go out at a certain time that you may be busy and not able to respond to any activity from your audience, you won’t be able to respond in real-time. This can make your page seem less personal, and readers will sometimes be able to pick up on that. Your page won’t seem in touch. By scheduling ahead of time, you are reducing the relevance of your posts to current events. So if a piece of breaking news hits, you wouldn’t be able to incorporate it into your posts. As you have your posts already scheduled out, it would be difficult to adjust the posts when that breaking news comes in. Scheduling social media posts has it’s pros and cons, but can definitely be of much value if used right. Here are some tips to successfully use a scheduling program to your benefit. Don’t schedule posts too ahead of time, meaning schedule out for the next few days and not the next few weeks. You don’t want to reduce the relevance of your posts. Always be sure to check for spelling grammars and correct use of links. Even if that means, reviewing the content for spelling errors a few times and hitting every link making sure it takes you to the correct location for each post, be SURE to do it. And lastly, give yourself time to plan it out. I recommend setting up a block time to solely focus on your social media posts, that way you can get it out of the way and will reduce chances of making mistakes. DC Nightowls Coworking Session @ Flex! 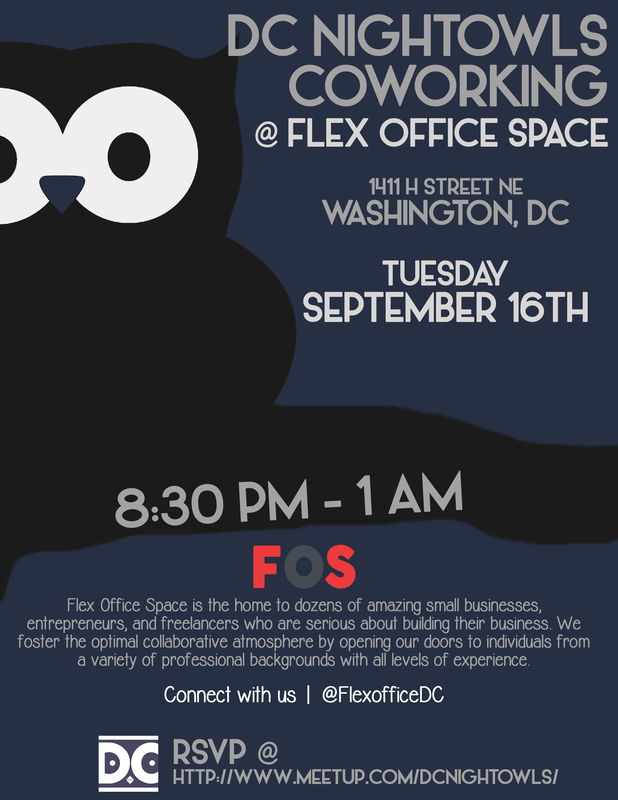 Join us for our first @dcnightowls coworking session Tuesday September 16th from 830PM – 1AM! Located at 1411 H St NE in the bustling Atlas Theater district, Flex Office Space is the perfect location to do business all over the city. Bring your own project, your excitement for a new space and your willingness to help others! 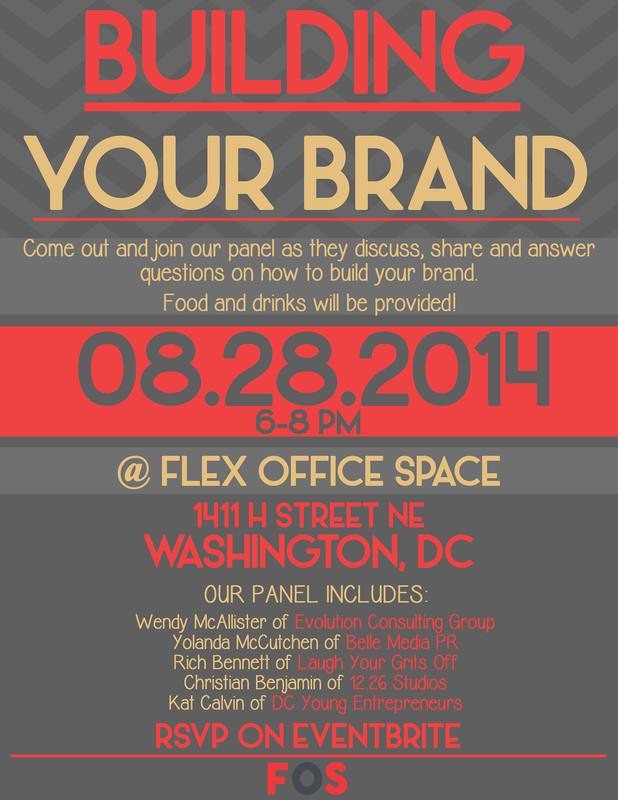 Our awesome panel will be ready to answer and discuss all your questions! 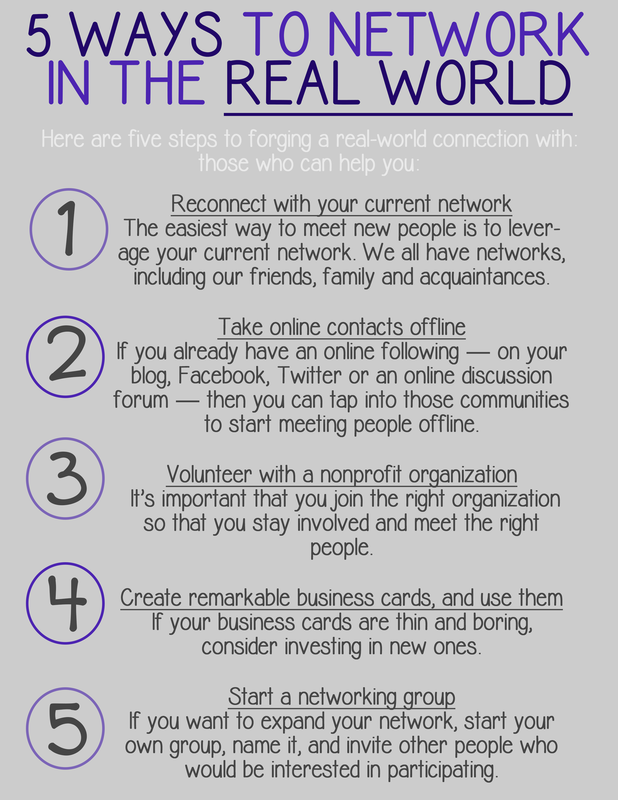 Build a stronger online network by grounding those connections in face-to-face encounters. 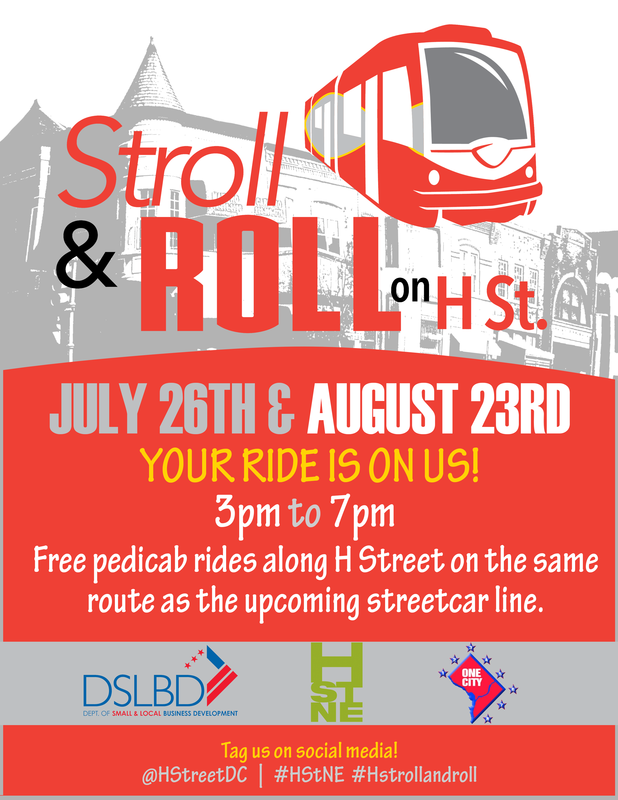 Join us for out next event!